Most home and business owners are anxious to achieve the green, thriving lawn that is the envy of the neighborhood. Getting to that point is not an easy process, but with professional lawn installation by Boulder Falls Landscape, you’ll be well on your way. Old lawns that are thinning and full of weeds. In any of these situations, an expert lawn installation could be the right solution. The good news is that you have many options that are available in a variety of price ranges. Is Sod Installation the Right Choice for You? Sod installation is the perfect choice for property owners who want to see results that are almost immediate. In fact, many of these new lawn installation services can be finished in a couple of days. Property owners can go from no lawn or a diseased lawn to thriving, hearty turf in surprisingly little time when they choose sod installation. This process begins with ensuring that the soil is in optimum condition for growing grass. This may mean amending the soil with some mulch and compost and working to ensure proper drainage in all parts of the yard. The soil can be smoothed, flattened or leveled to achieve almost any look that the customer desires. If no irrigation system is installed, this might be the right time to have some sprinklers put in to guarantee that the new sod gets the hydration it needs. Then, it’s simply a matter of placing the fresh-cut sod onto the prepared soil. Sod installation takes less time than most people imagine, and the results are amazing. Hydroseeding is most often seen in new developments and construction projects, but it can be used anywhere. Highly-trained technicians use a truck and a special spreading tool to cover the prepared soil with a potent mixture of fertilizer, mulch and grass seed. Regular watering is essential to success with hydroseeding, so a new irrigation system is a great addition. Within four to six weeks, you’ll have a gorgeous lawn that’s ready for its first mowing. 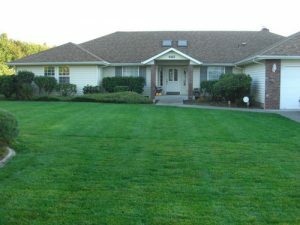 Contact Boulder Falls Landscape today to learn more about lawn installation throughout Clark County.